Early in the morning of March 15 – the Ides of March – we lost a friend and colleague of huge stature and import. The extraordinary curator, writer and educator Okwui Enwezor died of cancer in Munich, where he had been Director of the Haus der Kunst from 2011 to 2018. NYU students had the good fortune to experience Enwezor’s panoramic vision up front and personal, and all of them speak of the enormous impact his classes had on their concept not only of Art History but also of global culture and understanding. Several of our collective students in the Global Issues in Contemporary Photography seminar expressed their sorrow after his death, and their appreciation for the time spent with him. Allison Young (our Course Assistant) called him a “gift,” and Catherine McKinley saw this class as a “privilege.” The last conversation I had with Okwui, a long international call, was a few months ago; for an hour we discussed his recent essay for the Whitney Museum’s Warhol exhibition catalog, the artist’s significance, and eventually his Shadows series – about which we disagreed, vehemently. Enwezor called me his “sparring partner,” and one of our favorite things to do was to argue – with great gusto and evident delight — in class, inviting the students to join in. 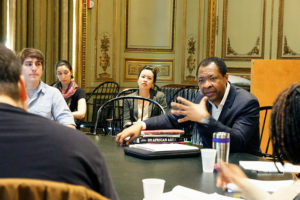 Okwui’s expansive mind, and his joy in using it to the fullest, were inspirational for our students, who saw our spirited disagreements as empowering. In the classroom, as in his exhibitions and writings, Enwezor gave us the gift of the Big Picture – and in return he left his students with the mandate to move it forward. Now working all over the world, they have shouldered this responsibility with pleasure and pride, and with gratitude to NYU. Last fall, before the illness became too overwhelming, Okwui began exploring the possibility of coming back to NYU to teach on a more permanent basis – a testament to the connection and respect he felt for us too, until the end.